Set a border width and color using the new feature on the properties panel. 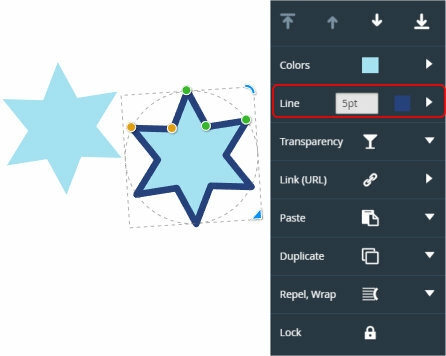 Select an item, enter a value for a width (the size defaults to points) and choose a color by tapping the patch or the arrow to display the color editor. Along with PNGs and JPEGs you can now download a selection as an SVG file. Select a single item or marquee drag around several items to create a selection, then export using the option in the Download > SVG menu. The new Logo category in the + Add insert menu now allows you to insert a logo from a variety of sources. This replicates the options found on the Replace Logo or Replace Symbol context menu. New sign-up/sign-in screens for desktop and mobile with separate pages for signing up and signing in. Smoother and faster list editing. Many other 'under the hood' fixes and improvements.